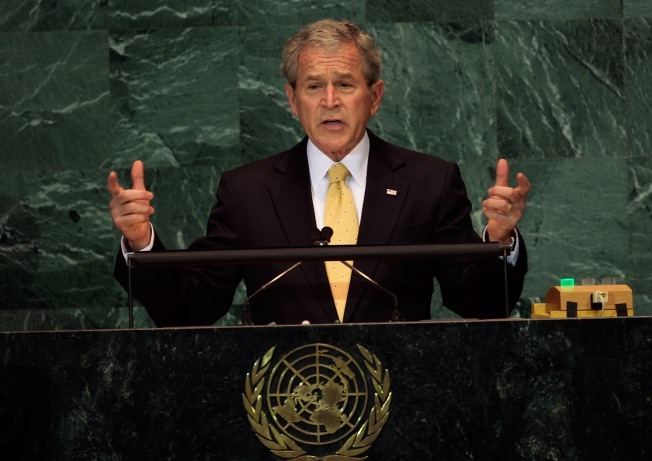 President George W. Bush speaks to the Culture of Peace assembly Thursday at the United Nations in New York. Bush spoke about the importance of faith in his life and in world affairs. This weekend's summit of world leaders was supposed to generate ideas about how to repair battered financial markets. Instead it is shaping up as a philosophical debate about the future of free-market capitalism. President George Bush has invited leaders of 20 of the world's richest and most populous countries to discuss how to stem the global economy's slide and repair the battered financial markets. But with President-elect Barack Obama keeping his distance, there is little likelihood that major steps will be take to transform the world's economic order. Given the current fragile state of the global economy and financial markets, that raises the prospect of a dangerous drift until Obama's inauguration Jan. 20. In his speech, Bush made an impassioned defense of the financial system and warned against over-regulating the free markets. Speaking of a global crisis sparked by a wave of rogue lending and widespread mismanagement of credit risk, Bush said that what’s needed is “smarter” regulation, not more regulation. “The crisis was not a failure of the free market system," Bush said. "And the answer is not to try to reinvent that system." But that system remains badly broken. On Wednesday, Treasury Secretary Henry Paulson stunned financial markets with news that he had decided to reverse course on the administration’s primary response to the crisis, the $700 billion bailout program to buy up failing investments backed by defaulting mortgages. Instead, Paulson said the Treasury and Federal Reserve were working on yet another plan — this time to try to restart the frozen market for consumer credit. Paulson attributed the shift in bailout strategies to “changes in market conditions.” But the Treasury was never able to establish a mechanism for determining the value of the troubled assets it was supposed to buy. Critics of the so-called Troubled Assets Relief Plan or TARP, said that sticking point doomed the program before it began. As recently as Monday, Neel Kashkari, the Treasury official named to head up the plan, had briefed hundreds of bankers, investors and other officials in New York on the plan’s progress. When Congress revised Paulson’s original TARP proposal in September, it added provisions designed to ensure that some of the funds would be spent to help slow reverse the rising tide of home foreclosures. At the time, Paulson argued that it would be easier to modify mortgages to more affordable terms after the government owned substantial chunks of the investments backed by those mortgages. Now attention has shifted to more direct methods of preventing foreclosures. The urgency of the task was underscored Thursday with the release of a report that at least 279,500 homeowners got a foreclosure notice in October, up 25 percent from a year ago. That marks the 34th consecutive month of year-over-year foreclosure increases, according to RealtyTrac Inc. Rising unemployment is expected to force more homeowners into default. Congressional Democrats are calling on the Treasury to step up efforts to provide more direct help to homeowners. On Friday, a House panel is scheduled to hold a hearing to look at whether the Treasury is moving aggressively enough to use its bailout funds to stop foreclosures. Kashkari is expected to testify. Congress may get another chance to review the Treasury’s progress soon. So far, roughly $290 billion has been spent or committed. Under the TARP law, the Treasury only has access to the initial $350 billion of the $700 billion package. To access the second $350 billion, this administration or the next will have to make a request to Congress for the money. In any case, the suspension of the plan to buy bad mortgage-related investments leaves the longer-term fate of the program in limbo. “The emerging tug-of-war about how to deploy the TARP resources between the Treasury and the Congress could unravel much of the progress that has been made since mid-October,” Brian Bethune, HIS Global Insight’s chief U.S. financial economist, wrote in a note to clients. Now, as leaders of the world's 20 largest economies gather in Washington, they’re expected to call for greater global cooperation and regulation of financial markets. Many of those leaders fault the excesses of U.S. free-market capitalism, and a lack of regulation, for the current economic turmoil. In a news conference Wednesday, Paulson conceded that reforms are needed. But, in an apparent preamble to this weekend’s meeting, he said there are more problems facing the global economy than a wave of failed risky bets on Wall Street. “(The) excesses cannot be attributed to any single nation,” he said. “There is no doubt that low U.S. savings are a significant factor, but the lack of consumption and accumulation of reserves in Asia and oil-exporting countries and structural issues in Europe have also fed the imbalances." The global nature of the worst financial crisis in 80 years came into clearer focus this week. With the downturn apparently accelerating, the Organization for Economic Cooperation and Development cut its economic forecasts for the United States, Japan and Europe, saying all three were headed for recession. Germany, Europe's largest economy, reported that its output shrank by 0.5 percent in the third quarter, the first contraction in five years. The once-sizzling Chinese economy also is cooling, with industrial growth slowing in October to its weakest pace in seven years as manufacturers scaled back production. The Chinese government unveiled a $586 billion economic stimulus package, briefly cheering financial markets. But as consumers cut spending sharply in its primary markets, Europe and the United States, the problems facing Beijing’s leaders will likely worsen. At home in the United States there are few positive signs. More than 500,000 people filed new claims for unemployment benefits in the latest week — the worst showing since the weeks following the Sept. 11, 2001, terrorist attacks. Obama and other Democrats are proposing a new package of fiscal stimulus and help for ailing U.S. automakers, but such measures are likely months away from enactment. Japanese politicians are debating the details of their own pump-priming plan and the British government is expected to follow suit in a report later this month.